27 Years ago… even as a video game… this is painful to watch. For the record: Bill Buckner is a good man. He was a great baseball player. 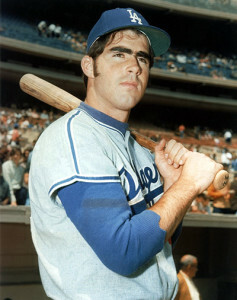 We played together on the ’71 Dodgers. He had the type of career most players only dream about. Sadly, the vast majority of the people in the world only remember one thing about him. They don’t remember him playing 22 seasons while collecting 2,715 career hits and a career .289 batting average. They don’t remember him hitting .300 or more seven times and winning the 1980 NL Batting title. They don’t remember him on the 1981 NL All Star team. Sad. Without Buckner’s contributions the 1986 Boston Red Sox likely do not win the American League Eastern Division and go on to beat the California Angels for the American League Pennant. In 1986, he knocked in 102 runs at the age of 37 playing on two brittle ankles protected by those memorable black high top cleats. That error did not lose the Red Sox this game… the Mets had already tied the score, held all the momentum, and were facing a vulnerable Red Sox bullpen. Yes, Bill Buckner made an error. No, Bill Buckner did not lose the series.